This article is for beginners who never traded options but wanted to give it a shot because they understand how powerful options can be in making money. If you want monthly income besides dividends, trading options can be a great tool for you to boost your portfolio. If you want to learn trading options and generate income every month or every other month (it depends on how much money you are willing to commit) the strategy I am about to explain can be a great learning start for you. Recently, I discussed options trading with a few people, friends and even my co-worker and I surprisingly found out that there are a lot of people who are afraid of options or have little knowledge about this topic. It is OK to fear options since the fear can make you cautious but it can also paralyze you from trading. Over my trading and investing career I traded all sorts of option strategies, such as iron condor (my favorite), butterfly and both put and call spreads. I made money, but I also lost money. At the end I didn’t feel comfortable with the advanced options trades. It could have been because of lack of my knowledge or just those trades did not fit into my investor’s profile. I searched what options trades can make me feel comfortable. Here is a simple strategy which you can use and which can provide you with peace of mind and calm nights. Trading options is surprisingly easy and safe although you will hear otherwise from people and brokers. They will even give you a disclaimer to read where they will scare you to death from trading options. To trade options you need to be approved from your broker. I won’t describe the process here. Contact your broker and get approval for basic options trading – covered calls and cash secured puts. This shouldn’t be a problem and you should obtain it easily. The first and simplest strategy is selling put contracts against stocks. In this article I assume you already know what calls and puts are. If not, take some books or search the internet to find out. As with stocks, you can be buying options and you can be shorting (selling) options. In this article I will show you how to easily sell puts (short puts). Why do you want to be selling puts instead of buying them? When selling puts you will have a powerful friend on your side. That friend is time. With this friend, you do not have to worry about your put contract during its entire life. When buying options, time will be against you and the underlying stock will have to move by a large point in order to make money. When selling, you want time to deteriorate your option. The second benefit is that you get paid for selling the put and that money will be yours forever and no one can take it away. Always sell puts against stocks you are OK to own. This means that you first select stocks you would normally buy yourself. I suppose you are an investor and you buy stocks to make money. The stocks you already have in your portfolio or in your watch list are your best candidates for simple put selling strategy. For example, I have a few stocks in my watch list such as GLW, SWY, FGP, T, O, etc., which I want to buy. Instead of buying those stocks right now, I would use them for my put selling strategy. For our example I chose Corning Inc. (GLW). It is a dividend paying stock which I want to buy although not right now. Once you selected a stock you want to use for your income machine, find the options chain. 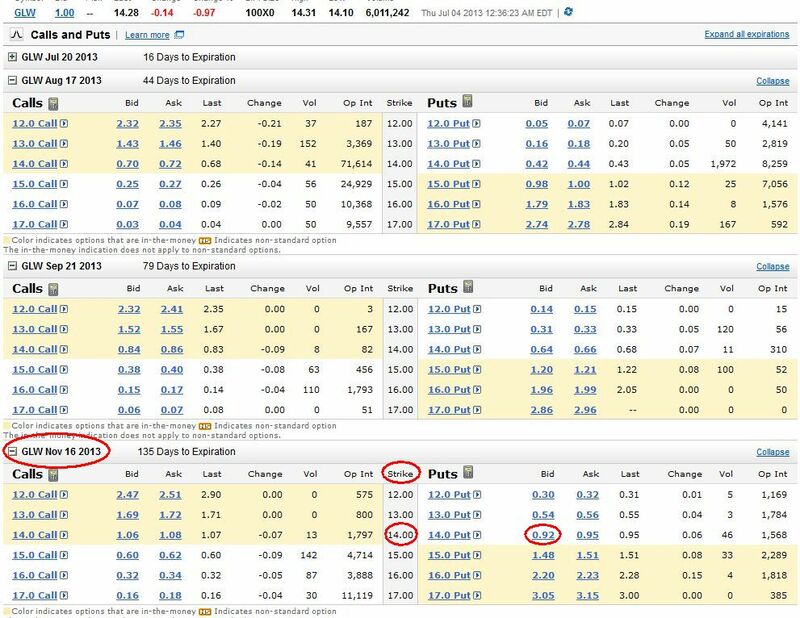 Go to your broker account and under GLW stock summary find a link which can take you to the stock’s option chain. On the screen you will see two major columns. The left will be for calls, the right one will be for puts. I usually want to sell a contract with expiration day two to three months ahead. Which put contract to sell?. The picture below shows a typical options chain table. On the right side you will see put contracts. The colored lines indicate in-the-money (ITM) contracts, the white lines indicate out-of-the-money (OTM) contracts. If you are very bullish on the stock, you can select ITM contract (15.00 strike), if you are not sure which direction the stock will go, select the nearest OTM contract (14.00 strike). In our example I would go with November 16, 2013 contract, 14.00 strike and I would receive 0.92 or $92 per one contract. Execute the trade. When you click on the 0.92 link on your broker’s screen, you will be prompted to a trade form entering a trade to sell 1 GLW Nov 16, 2013 14 put at 0.92. Make sure you are really selling and not buying the contract. Once executed, you will see that you are negative (short) one put contract of GWL. Now you just collected 92 dollars and all your effort is over until November 16th 2013. No need for analysis. Keep it simple. You do not need any analysis or sophisticated knowledge with this strategy. All you need is to select a stock you are OK to own, select a proper put contract and sell it. You do not have to deal with Delta, Gamma, Theta, volume or open interest with this strategy. You also do not have to worry what direction the stock will go in the future. If anybody tries to tell you otherwise, he is probably trying to impress you with his (lack of) knowledge of trading options. Ignore them, you really do not need anything they will try to sell you. All you have to do once you executed a trade is to wait. What’s next after you sold a put contract? After you sold your put contract and collected your premium the next thing to do is wait. You will wait until expiration in November. There are three possible outcomes which may happen to you during your waiting time. Worthless expiration. The first thing which can happen to you is that our stock will be trading above $14 strike price on November 16th. In that case our put contract will lose its value and becomes worthless. Our friend time will destroy it. And it is a good thing! It is what we want. We sold a contract for 92 dollars and now it is worth zero dollars. We keep our $92 premium we received. And the best part is that you can repeat the entire process again and again. Assignment. The second outcome which can happen to you is that our stock will drop below 14 strike on November 16th. In that case our contract will be ITM and we will be assigned 100 shares of GLW @ 14 dollars a share. Let’s say GLW will be trading at $12.98 a share at expiration day. You will have to buy 100 shares for 14 dollars a share instead of $12.98 a share. Although it looks like a bad deal, do not forget that you have received 0.92 a share, so in reality you are buying for $13.08 (14.00 – 0.92 = 13.08). It is the same as buying for $14 dollars a share but three months later (minus premium received). You wanted this stock anyway right? Instead of buying it for $14 a share today, you will buy it for $13.08 three months later. Early assignment. The third outcome is that you get assigned prematurely. That can happen to you if the stock drops so deep in price that the buyer who originally bought the contract from you decides to execute the option before its maturity day. Although very unlikely, it is a possible option. If that happens to you, it may not be pleasant either since you will be buying a stock for 14 dollars a share while it is trading for let’s say $6 a share at the time of assignment. In this case you worked as an insurance company for the buyer of your put contract. This is a great example and a reason for selling puts against stocks you want basically at any price. If this happens to GLW you can start selling calls to fix the trade and collect dividends while waiting for recovery. Selling calls will be my next post. The above described strategy is basically a win-win strategy. No matter what happened you collected an income and you can repeat the process, or you bought a stock you wanted to buy anyway. Below is a chart of my current options trading showing my income machine. It shows my collected premiums from put selling and from so called total return covered calls selling. This strategy gives me a peace of mind while trading it. It boosts income in my portfolio (besides dividends). I no longer have to predict what the stock may do in three months or construct sophisticated options contracts. I do not have to care about the contract at all as long as I still want to buy the stock. I used this strategy to learn in real life about options and I could learn a lot without fear of losing money. You can do the same. Select the stock and sell puts against it as long as you get assigned or collect income indefinitely. You do not have to worry about anything. It is that simple. Try it and let me know how that worked for you. Also contact me if you need help or detailed explanation. Very nice write up. Here’s a couple of extra points. You always have the ability to buy the option back if you want to free up the cash for future investments or if you’ve changed your mind about wanting to be assigned the stock. In most cases, you’ll still make some money on the option since time decay is your friend. Figure out what your annualized return on the option sale would be. Sometimes put options aren’t worth selling even if you like the stock – since your money could be doing more for your elsewhere. Good points MFIJ, but my post was meant for a total newcomers. It may be overwhelming then to open your first position and then be required to roll it or buy it back etc. So for the very first moment the best thing you can do is nothing. Let it either expire or assign. When you will be selling your 100th contract you will have a perfect knowledge what to do next or in case you do not want to be assigned, or just simple free the money for another and better trade. Nice write-up. This is helpful for anyone new to options. One other outcome you might add is that the price of the stock could have shot up making your put almost worthless well before expiration. In this case you could buy back the put early for a profit and maybe use the funds to sell another put. You are putting out a lot of content, keep it up. Take care! AAI, yes that’s another outcome. But when I was writing this article I had a complete beginner on mind, who doesn’t yet fully understand all possibilities and strategies he or she has available. For such a person it is easier to sell and then wait for the end. Of course, I myself in some cases would buy such option back and sell another one. And definitely I would do that with cash secured puts to release cash for next trade. I like selling puts although cash-secured is difficult for me since I see so much cash just sitting there. Even though I know I’m earning a good return it’s hard to for me to see. I got margin approval and have started to sell naked puts. It’s definitely not for everyone but as long as you’re good about keeping your leverage in check it can be another added boost. When selling puts I try to shoot for something that would give a cost basis if executed at a price I’m comfortable with or a 10%+ annualized return if it expires worthless. There’s usually fewer of these combinations but I feel it’s a pretty solid strategy and I’m happy with the results thus far. I might slide the return down to 8-9% since it opens up a few more of the options. JC, I totally understand and agree with you. I do the same and sell naked puts too. But a complete beginner should have it secured before he gets the knowledge and feeling about options. If you do not know how to roll the put to avoid assignment in case you do not have the cash available for the purchase, you want to stay with secured puts. Although I sell naked puts I still want to have reserves in case of early assignment. I own 100 shares of GIGMO and am considering selling a put option. My understanding, having never have done this before is that I would want to sell a PUT option that is far out of the money and has some time left. In this case I believe that I would sell a PUT option at Jan 20 at $55.00 strike price. That would net me the selling price and in the unlikely event that the stock hits $55,00 I have the stock to cover the trade. Do I have that right and how do I unwind the sale (and when)so that I do not get stuck with a big bill. First, you need to understand how options work before you commit your own money. If you do not know, I would recommend you to do some reading about options and trade on paper money account before you commit your own cash. So, in your example, if you sell 55 strike of GIGMO (sic.) (I assume you meant GIMO) put option, with the stock trading at 47.25 your put will be in the money (ITM) and at expiration you will be obliged to purchase 100 shares of GIMO (or even early if early assignment occurs). Also, your current stock holding will not cover your put! Only calls can be covered. 1) leave it, get assigned and sell your shares at $55 a share. 2) roll your position up higher (which may be difficult to achieve so you may need to apply strangle strategy or inverted strangle) or roll as early as possible. 3) if a roll is not possible, you may choose to buy another 100 shares below your strike and let those get called away at expiration.